The Cocker Spaniel is an elegant breed renowned for his pleasant attitude and a happy wagging tail. In order to maintain weight control and support a healthy skin they can benefit from tailored nutritional care. 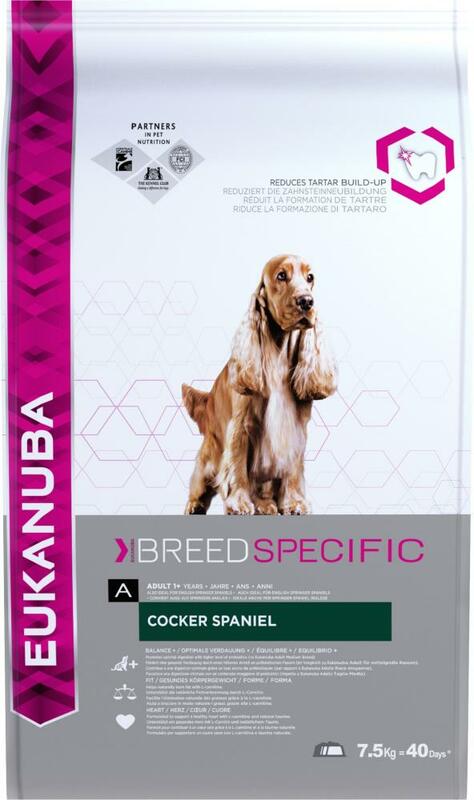 Eukanuba Cocker Spaniel Chicken is a complete and balanced daily food designed to help manage weight, promote healthy skin and a luxurious coat. Recommended For: Adult Cocker Spaniel (1+ years). Vitamin A (45375 IU/Kg), Vitamin D3 (1506 IU/Kg), Vitamin E (252 Mg/Kg), L-Carnitine (48.2 Mg/Kg), Beta-Carotene (5.0 Mg/Kg). Contain Basic Cobaltous Carbonate Monohydrate (0.63 Mg/Kg), Cupric Sulphate Pentahydrate (60 Mg/Kg), Potassium Iodide (4.4 Mg/Kg), Ferrous Sulphate Monohydrate (799 Mg/Kg), Manganous Sulphate Monohydrate (60 Mg/Kg), Manganous Oxide (43 Mg/Kg), Zinc Oxide (278 Mg/Kg). There are currently no questions for Eukanuba Adult Cocker Spaniel Chicken Dog Food - be the first to ask one!